Taua’i Ponesi Faavae is a Lay Preacher in Inala. He is also the Secretary for the Inala Parish. 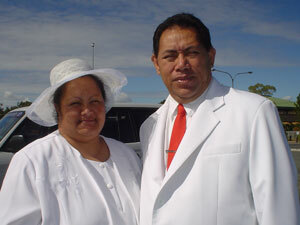 He has been a Lay Preacher in New Zealand in the past and they moved to Brisbane, Australia in the year 2004. Taua’i is the son of Mr Su’a Faavae of Papa, Sataua, Savai’i in Samoa. His good wife Tara is the daughter of Mr Rota Ariki from Reureu, Aitutaki in the Cook Islands. They have six children and are very compassionate and dedicated Christians. 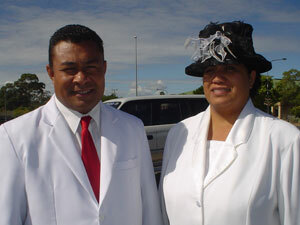 Apisaloma Loketi is a Lay Preacher in Inala. He is also the President for our Sunday School. He has been a Lay Preacher in one of our Churches in Auckland, New Zealand for a number of years. They emigrated to Brisbane in the year 2007. He is the son of Tagaloa Lefua Loketi of Sataua, Savai’i. His good wife Lolina is the daughter of So’oalo Talia of Samauga, Itu-o-Tane, Savai’i in Samoa. They have two children and are very committed to the Lord and His Work. 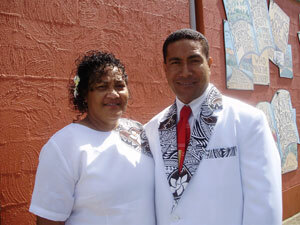 Taua’i Likati Su’a is a Deacon in our Inala Parish. He has a very friendly and encouraging personality that every Christian would be blessed to have. His positive attitude draws people to come together and worship God in unity. His good wife ‘Avea Mahina is the daughter of ‘Au Pa’ese of Samauga, Itu-o-Tane, Savai’i in Samoa. They have a grown up family who are all dedicated Christians and are very strong in the Lord.